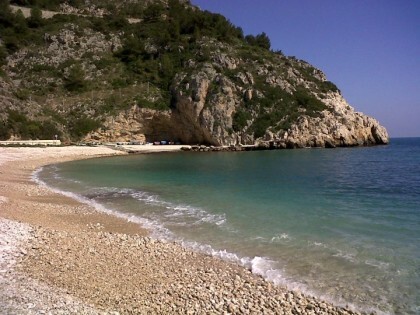 Jávea is split into three very diverse areas: the old town, the port and the beach area. Parts of the old town date back to the 13th Century and up until the end of the 19th Century it was still a walled town, its defences protecting the local population from marauding pirates. The fortified Gothic Church of San Bartolemé, which dominates the centre of town, dates back to the 15th Century and has been designated as a ‘National Artistic Monument’. The port area still functions as a working fishing harbour but it shares the limelight with an upmarket yacht marina and a popular promenade with open-air terrace restaurants and popular local bars offering spectacular views across the bay. The Arenal is the popular beach area, a crescent of clean, white sand lined with a wide promenade with its numerous bars and restaurants. The Jávea International Civic Society publishes ten bulletins each year relating specifically to what’s going on around Jávea as well as information concerning the Valencian Community and national changes to law and taxation. There is also the excellent online website My Jávea on which you can discuss the various issues with fellow residents and would-be residents. The town hall has also revamped its online presence and is now available not only in Castellano and Valenciano but also in English, French and German. The local football club CD Jávea are beginning to attract support from all the ex-pat communities and they have an officially-recognised international supporters’ club Jáveamigos. Residents and holidaymakers alike are entertained by three local English-speaking radio stations: Bay Radio, Coast FM and Pure Gold FM. There is a cinema in the port area www.cinesxabia.com which shows films in English almost every week whilst lovers of live theatre can be entertained by the The Jávea Players at the theatre in the old town. The Marina Alta Business Club, a networking Club for English speaking businesses in the area, meets monthly in Jávea. The Jávea Grapevine magazine is free and online and has regular features and photos about people and events in Javea, including a list of local clubs and a comprehensive restaurant review. There is no scarcity of places to eat and drink in the town and whatever your tastes you can enjoy everything from fast food to gourmet meals in prestigious venues. The local papers all have online editions and you can keep up with all the news with The Costa Blanca News , The Round Town News and the Euro Weekly in English. Other monthly papers include Javea Jeard run by Clive and Ann Read from the Jávea Evangelical Church available for 1€ from various local shops including Iceland. For property in the area one of the premier agents is Sunset and, if you are looking for “Rent to Buy”, Rent To Buy Spain has a wide range of available properties at all price levels.